The amazing BIG BOX Wizard Video Collection! This is truly a rare discovery and little part of the early days of the home video explosion! Welcome to Fedar Dalmar's castle, the most luxurious estate in Central Europe. 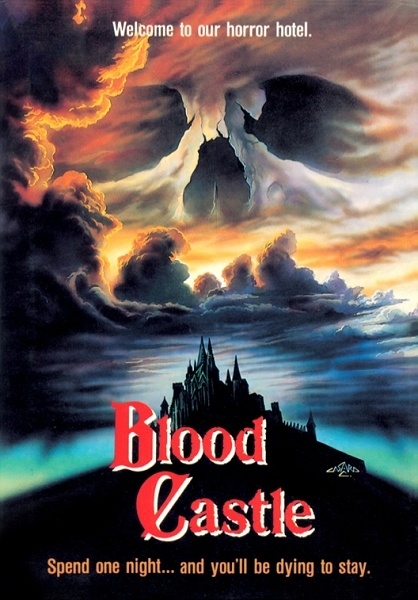 Just one word of caution: inside lies something so incredibly ferocious that it alone can transform Dalmar Castle into BLOOD CASTLE! One night, beautiful young Ivana starts a moonlight trek to the mysterious chateau, even though numerous village girls have been stalked, raped, and murdered by a phantom knight and his two vicious bloodhounds. When she at last reaches the castle and meets Fedor Dalmar, she uncovers his macabre efforts to re-animate the hideously burned corpse of his brother. So far, Fedor's experiments have failed. Or have they? A twisted family secret and a hellish journey into mind-blowing horror await all those who enter the crimson halls of BLOOD CASTLE! Do you dare...?